Ty Reading from Fairview Heights, Illinois is Dueling against Neil Henning from Kalamazoo, Michigan in our Round 1 Feature Match! Reading is using a “Train” Deck, enhanced by the newly released Legendary Duelists: Sisters of the Rose booster set. Reading’s Deck includes 3 copies each of Super Express Bullet Train, Flying Pegasus Railroad Stampede, and Urgent Schedule, as well as 2 copies of Superdreadnought Rail Cannon Juggernaut Liebe in the Extra Deck, all from Legendary Duelists: Sisters of the Rose. Reading is also using a small Shaddoll engine consisting of 2 copies of Shaddoll Beast, 1 copy of Shaddoll Dragon, and 3 copies of Shaddoll Fusion so that he can Fusion Summon the Level 10 El Shaddoll Shekhinaga from his Extra Deck. Henning is using a Zombie Deck packed with cards from Structure Deck: Zombie Horde. It’s time to Duel! Henning won the die roll and chose to go first. He activated Zombie World and then activated the effect of the Danger! Dogman! in his hand. He randomly discarded Zombie World and Special Summoned Danger! Dogman! before drawing a card. He Set a card to his back row and then Normal Summoned Shiranui Solitaire. He Tributed it to use its effect and try to Special Summon a Zombie from his Deck, but lost out to Reading’s Ash Blossom & Joyous Spring. He passed his turn. Reading drew Monster Reborn and then had Shaddoll Beast, Super Express Bullet Train, Pot of Desires, and Ash Blossom & Joyous Spring in his hand. He used Pot of Desires to banish the top 10 cards of his Deck face-down and draw Red Reboot and Night Express Knight. He Normal Summoned Night Express Knight with 0 ATK and Henning flipped Rivalry of Warlords. Reading Set Red Reboot and then ended his turn. Henning Normal Summoned Goblin Zombie and attacked the Night Express Knight to destroy it. Goblin Zombie’s effect sent Flying Pegasus Railroad Stampede from the top of Reading’s Deck to his Graveyard. Then Dogman attacked directly, dropping Reading down to 4500 Life Points. Henning sent his 2 monsters to the Graveyard to Link Summon Vampire Sucker next, and lost out on the effect of Goblin Zombie to Reading’s Ash Blossom & Joyous Spring. Reading used Monster Reborn to Special Summon Night Express Knight and used it to attack and destroyed Vampire Sucker. Henning Set a monster and passed. Reading attacked and destroyed Henning’s face-down Necroworld Banshee to destroy it. Henning Normal Summoned Raiden, Hand of the Lightsworn and used its effect to send Foolish Burial and Garbage Lord from the top of his Deck to his Graveyard. In the End Phase, he sent Gozuki and Reasoning from the top of his Deck to his Graveyard with Raiden’s effect. He used Gozuki’s effect to banish Dogman from his Graveyard and Special Summon Doomking Balerdroch from his hand. Reading Set Flying Pegasus Railroad Stampede and then attacked Raiden with Night Express Knight to destroy it and drop Henning down to 5300 Life Points. Henning drew Charge of the Light Brigade and activated it. 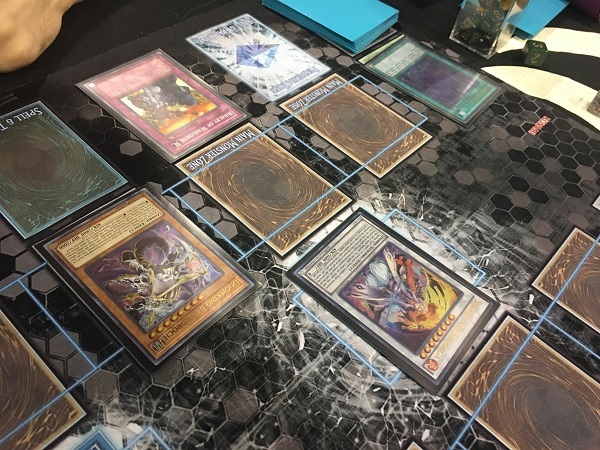 He sent the top 3 cards of his Deck to his Graveyard to add Raiden from his Deck to his hand and then banished Mezuki from his Graveyard to Special Summon Gozuki from his Graveyard. He used Gozuki’s effect to send Mezuki from his Deck to his Graveyard and then banished another Mezuki from his Graveyard to Special Summon Raiden. He used Raiden’s effect to send 2 copies of Shiranui Solitaire from the top of his Deck to his Graveyard and then Tuned Raiden with Gozuki to Synchro Summon Shiranui Shogunsaga. He used its effect to banish Raiden from his Graveyard and increase its ATK to 4700, and used Balerdroch’s effect to banish Night Express Knight. Balerdroch attacked and destroyed the face-down Flying Pegasus, and then a direct attack from Shiranui Shogunsaga ended the Duel! Neil Henning dominates the first Duel with his combination of Zombie World and Rivalry of Warlords! 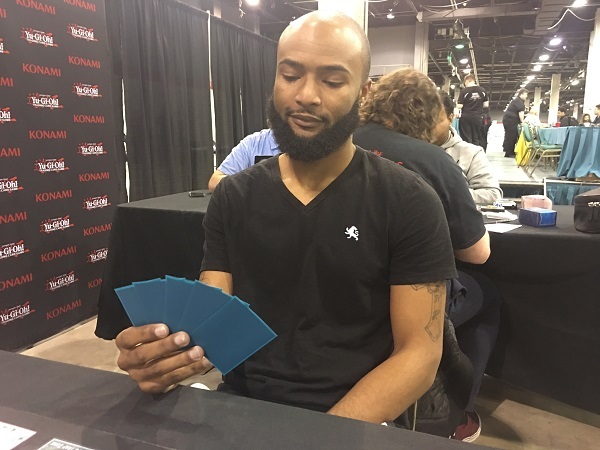 Reading opened up Duel 2 with Twin Twisters, Instant Fusion, Called by the Grave, Flying Pegasus Railroad Stampede, and Shaddoll Beast. He Summoned Flying Pegasus and Set Twin Twisters and Called by the Grave to his back row. Henning activated Zombie World and then Normal Summoned Uni-Zombie. He paid 2000 Life Points to Special Summon Garbage Lord from his hand next, and then used Uni-Zombie’s effect to increase the Level of Flying Pegasus by 1 and send Mezuki from his Deck to his Graveyard. Reading then flipped Called by the Grave to banish Mezuki. Henning Tuned Uni-Zombie with Garbage Lord to Synchro Summon Scarlight Red Dragon Archfiend. He attacked Flying Pegasus to destroy it, dropping Reading down to 6800 Life Points. 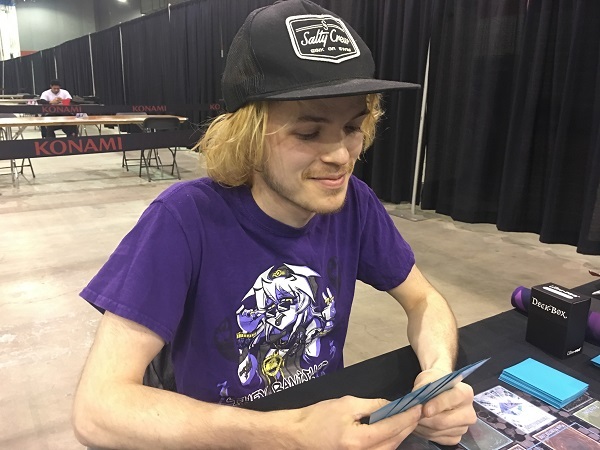 He Set a card to his back row, and then Reading activated Twin Twisters in the End Phase, discarding Shaddoll Beast to destroy Zombie World and Henning’s face-down Rivalry of Warlords. Reading drew another Flying Pegasus and then used Instant Fusion to Special Summon Thousand-Eyes Restrict. He used its effect to equip it with Scarlight Red Dragon Archfiend and then used the Thousand-Eyes to Link Summon Linkuriboh. He Normal Summoned Flying Pegasus Railroad Stampede and attacked directly with both monsters, dropping Henning down to 3900 Life Points. Henning Summoned Zombie Master and then discarded Goblin Zombie to Special Summon Uni-Zombie to his field. He used Uni-Zombie’s effect to increase its Level by 1 and send Mezuki to his Graveyard. He banished Mezuki to Special Summon Goblin Zombie from his Graveyard and then Tuned Uni-Zombie with Goblin Zombie to Synchro Summon Shiranui Shogunsaga. He banished Uni-Zombie from his Graveyard to increase its ATK by 1300 and used Goblin Zombie’s effect to add Gozuki from his Deck to his hand. He paid 2000 Life Points to Special Summon Garbage Lord from his hand next, and then combined Garbage Lord with Shogunsaga to Link Summon Knightmare Cerberus. He attacked Flying Pegasus with Zombie Master, and Reading used Linkuriboh’s effect to change Goblin Zombie’s ATK to 0. Henning ended his turn. Reading drew Terraforming and used it to add Revolving Switchyard to his hand. He attacked Cerberus to destroy it with Flying Pegasus and ended his turn. Henning Summoned Raiden and used its effect to send the top 2 cards of his Deck to his Graveyard. Next, he discarded Gozuki from his hand to Special Summon Goblin Zombie from his Graveyard with Zombie Master’s effect, and combined Raiden with Goblin Zombie to Synchro Summon PSY-Framelord Omega. He used Goblin Zombie’s effect to add Mezuki to his hand. Omega attacked and destroyed Flying Pegasus, and then a direct attack from Zombie Master dropped Reading down to 3000 Life Points. Reading drew Instant Fusion, and then Henning used Omega’s effect to return a Mezuki from his Banished Zone to his Graveyard during the Standby Phase. 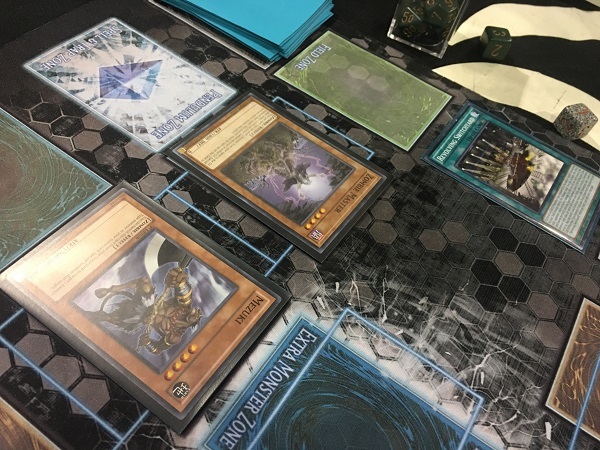 Reading activated Revolving Switchyard, and Henning Chained the effect of his Omega to banish Instant Fusion from Reading’s hand, along with the Omega from his own field. On his next turn, Henning used Charge of the Light Brigade to add Raiden to his hand. He Normal Summoned Mezuki and then direct attacks from Mezuki and Zombie Master wiped out the rest of Reading’s Life Points! Neil Henning takes a Round 1 victory with Zombies! Round 1 Feature Match: Jesse Choate vs. Michael Rodriguez YCS Chicago First-Timers!